Watch Paddy McGuinness’ hilarious photobombing of unsuspecting drinkers. A pint of McGuinness, sorry, Carling Paddy McGuinness in Carling's new ad. He’s used to causing mayhem on Take Me Out, but Paddy McGuinness has taken his pranks to a new level. As part of their Bank Holiday campaign, Carling offered punters a free pint in Manchester bar Shooters. To get their lager, punters were invited to pose in a photo booth with a virtual image of Take Me Out host McGuinness. But, far from posing with a mere hologram of the comedian, McGuinness himself actually appeared to surprise the drinkers. 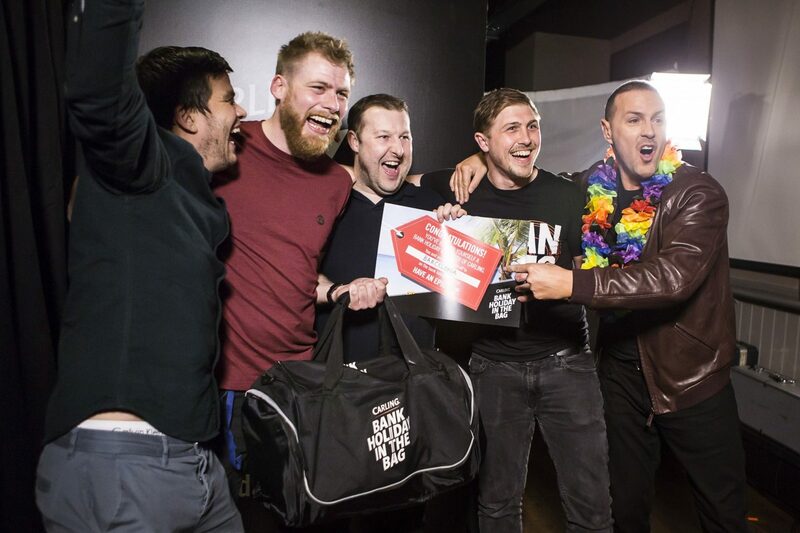 Wearing a multi-coloured Hawaiian boa on top of his leather jacket, McGuinness then presented some lucky mates with tickets to a Bank Holiday weekend getaway to destinations including Barcelona. The trips themselves can be won without the Phoenix Nights star’s help. Carling’s Bank Holiday In The Bag campaign is offering holidays over the May Bank Holiday to city breaks and beach holidays at to people who sign up here before April 22. Runners-up prizes include holiday bags including selfie-sticks. Meanwhile, McGuinness definitely isn’t returning to Coronation Street – despite posting a selfie outside The Rovers’ Return on Twitter earlier this week. The 42-year-old, who played survivalist nutjob Dougie Ryan in 2015, teased: “Dougy’s back for a butty.” But ITV bosses confirmed that McGuinness was only joking – he was actually visiting the set while filming another show altogether. McGuinness might be going back to the show that made him famous, however. Having got his first major break playing nightclub bouncer Paddy in Phoenix Nights with his friend Peter Kay. The show was last seen on Channel 4 in 2002, but McGuinness believes it will return at some point. But until that celebration comes along, it might be time to get involved with trying to win a free holiday.